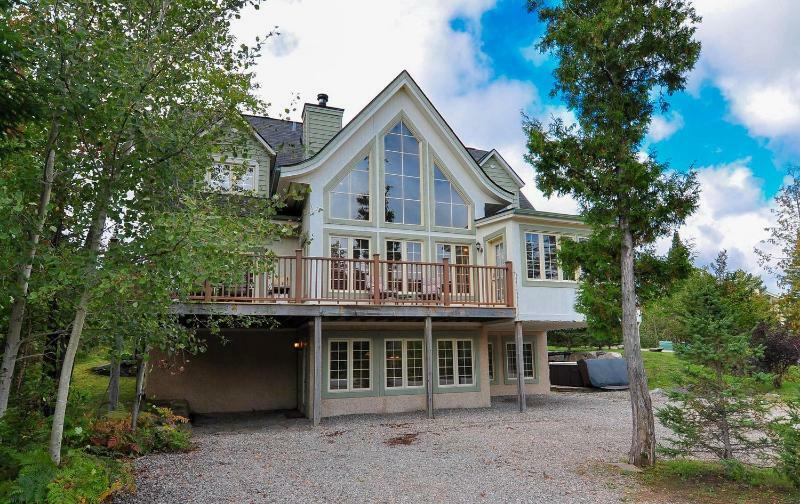 6 Bedroom house in Mont Tremblant - Chalet du Geant - ONLY 5-STAR is Tremblant resort! CHALET DU GEANT is an AMAZING privately owned luxury chalet rental property which is the ONLY 5-STAR rental chalet of all the Mont Tremblant vacation rentals available, located on Tremblant's "Le Geant", Quebec's #1 golf course directly on the resort with spectacular views of the #1 ski resort in eastern North America, and the #1 ski resort for lodging in all of North America!. Casino de Mont-Tremblant is only one kilometre from our chalet, with access by free resort shuttle!! Our chalet is unlike any of the condominium, apartment, hotel room or cottage accommodations on the resort. This six bedroom, five bath cottage accommodates 12-15 people and is ideal for family get-togethers or vacations, corporate retreats, ski or golf, spring or fall getaways. This is a cannot miss exciting winter or perfect summer Tremblant chalet vacation stay. Closest group of chalets to the pedestrian village at the base of the mountain. Park 6 cars and walk to everything.